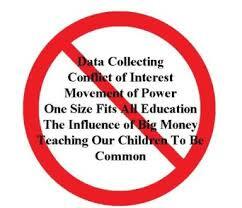 Although Common Core pundits screech that data collection is not part of Common Core, it is. If you read Common Core material and pay attention to the mandates being pushed onto the states as conditions of receiving federal funding (otherwise known as bullying “Do what I want or I’ll make things miserable for you…), you realized it’s all part of one big, rotten package tied with the Common Core bow. InBloom makes it “easier” for other companies to access our student’s data to develop applications, textbooks, professional development, and other products that will make them money–bottom line. Colorado has decided that enough is enough. On the heels of the Jefferson County School Board severing ties with InBloom and Bill Gates, bringing to a screeching halt the piloting of the intrusive longitudinal data system associated with Common Core, the Colorado Department of Education (CDE) announced on Wednesday that InBloom and Bill Gates need to go home. When CDE Commissioner Robert Hammond’s statement was read at the public CDE meeting Wednesday afternoon, cheers and clapping erupted in the room. Parent warriors, who came prepared to speak publicly against the program, were elated but surprised. Just Monday, Commissioner Hammond stated that opposition to the data tracking system was an issue for the federal government not him, dampening hopes that the state would follow suit with Jefferson County’s bold move. In a meeting later that day, however, the two school board members who were replaced by Jefferson County voters just a week ago, paid a visit to Hammond, handing him irrefutable evidence that this was, in fact, very bad for our state’s education system. According to Rachael Stickland, who was the lead parent warrior in ousting InBloom from Jefferson County, outgoing board member Laura Boggs told him that the state “needed to get their act together” and that parents were organized, informed and determined. Apparently, this got Commission Hammond’s attention, for two days later, he issued his formal statement breaking the contract with InBloom and acknowledging that privacy concerns of Colorado citizens need to be addressed. Colorado residents spoke with authority several times in recent months, with the recall of two heavy gun-control advocates elected to the state legislature and the defeat of the proposed education tax measure, Amendment 66. It appears Colorado government is taking the state’s residents seriously. Would you happen to have a link to any media stories covering this event? Well, we are media even though this particular piece is commentary, not written in news form. They sound rather petulant. Like, “Well, we thought this was best, but because you threw a fit, we’ll do something else for now.” Good for Jefferson County. I am coming to this fight new. Common Core sneaked up on me, as I have been out of the elementary/secondary education world for several years. I teach at the community college level, but home schooled my children for 14 years. Our district here in SE Kansas has an administrator that is very gung-ho for Common Core. I want to fight it as best I can, but I feel like a lone dissenter. And by the way, I picked up your article by Googling inBloom. Alliance Defending Freedom files suit against Academy School District #20 after public school censors religious discussion, expression during open period.